Because the OL6 is the smallest of our Onion Wall Lights it is typically placed in a secondary location on your home or garage. We cannot stress enough the importance of choosing the correct size Colonial Onion Wall Lights for your home. Therefore you should always consider Brass Onion Wall Lanterns OL12 or New England Style Onion Wall Lights OL10 for any prominent entrance. In addition Onion Copper Wall Lanterns RG12 make a grand statement. Consequently with its’ petite dimensions our OL6 Onion Wall Lights are generally reserved for a side entrance or perhaps a backyard shed. No matter the size or style, you always receive the same exceptional quality handcrafted copper or brass Onion Lantern. Along with Onion Wall Lights at Hammerworks you will find coordinating Onion Post Lights and Hanging Copper Onion Lights. Therefore if you need walkway, wall and overhead styles we have everything you need to achieve the look. Not only that, take your Onion Lights indoors. Consider Colonial Ceiling Onion Lights or a Hanging Onion Lantern in your front hallway or mud room entry. Due to the simple style Colonial Onion Lights blend well with a variety of decorating styles. Thus they are ideal anyplace throughout your home. We offer a great selection of Colonial wall Lanterns for you to choose from. Especially popular for its’ classic yet simple lines is the New England Wall Lantern Brookfield W112. 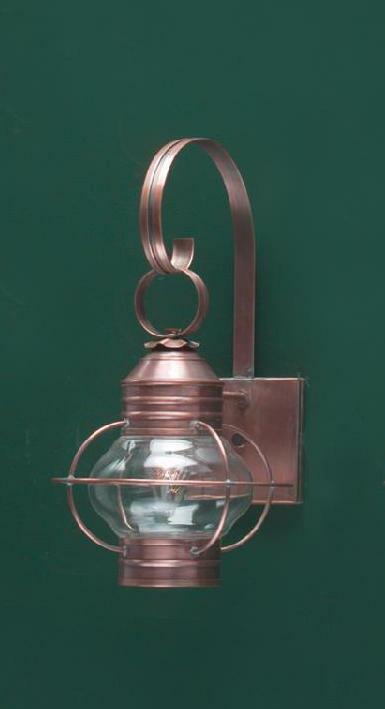 For your convenience we offer the larger companion Colonial Outdoor Wall Lights Brookfield W113 and W114. This attractive collection easily adapts to a variety of architectural styles. Therefore they are equally attractive on a primitive Early American antique home as they are on a grand traditional estate property. Furthermore the exceptional handcrafted quality of Our Reproduction Wall Lanterns always ensures complete satisfaction.